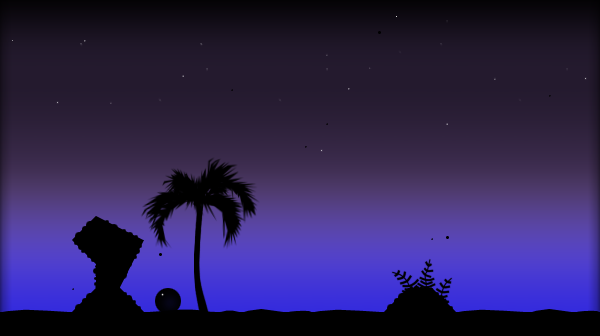 Nightsky is a very atmospheric game, with rather slow-paced music greatly matching and influencing the atmosphere. The graphics style is simplistic in colors (black) but has quite the details. You control a mysterious glowing Sphere. The story goes: You find it at the beach, take it home, and get strange dreams. You then move your sphere left and right, use slow-down or speed-up whenever available as well as invert-gravity to solve the “puzzles”. The puzzles are about figuring out how and where to go, and making the jump, matching speed etc. What I liked most about the game, aside from the great atmosphere and music, were the machines. You (the sphere) are occasionally placed in machines – be it driving, gliding or flying. That adds a bit of indirect control and has some interesting mechanics. I recommend this game. Get the second indie royale Bundle while you still can (19 hours left at the time of this writing), or check the game out later. If you think you could like it from some gameplay or screenshots, you probably will. It’s not too long in play-time, but a rather interesting experience and fun non-the-less. Also available on Desura and Steam. Nightsky was also the first game I tried some live-streaming on. I failed with sound – you won’t hear anything of the great sound or music. Anyway, you can still watch the video on twitch.tv (gameplay starts pretty much half through the game).